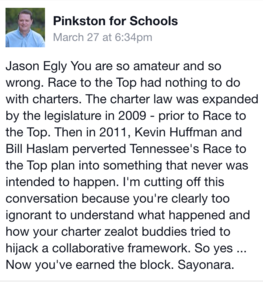 I was sent a Facebook comment by Nashville School Board Member Will Pinkston in regards to the Race to the Top grant that Tennessee won in 2010. 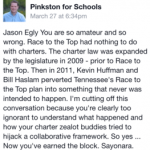 Pinkston claims that Race to the Top had nothing to do with charter schools. Race to the Top had everything to do with charter schools. Before I break down the Race to the Top application, let’s revisit the Will Pinkston of 2013 after he was elected to the school board. In 2013, Pinkston praised Kevin Huffman and Bill Haslam for their work in continuing the reform started under Bredesen. Pinkston also endorsed Haslam in 2010, around the time he worked for Bill Frist’s State Collaborative on Reforming Education (SCORE). Pinkston also advocated for charter schools. I remembered that Will Pinkston as I read through the Race to the Top application that was submitted by the state of Tennessee. 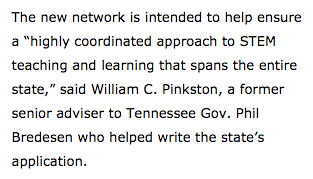 Let’s remember that Will Pinkston helped write the application while he worked for Governor Phil Bredesen. You can read through the application here. The Race to the Top grant application mentions “charter school” 108 times. The Achievement School District was mentioned a lot in this grant application. Will Pinkston has said that he was in the room when the Achievement School District was created. According to the grant application, the ASD would pull together an “unprecedented set of non-profits” to open charter schools in the ASD and other schools. The ASD was created, from the beginning, to partner with an unprecedented amount of charter schools. The application, which Will Pinkston helped write, gushed over how great charter schools are. It also shows how Tennessee wanted to use charter schools to help in the turnaround of failing schools. The application shows Tennessee’s love of charter schools by showing that Governor Bredesen signed an updated charter school law in 2009. The application goes on to say that the state is actively recruiting charter school leaders to the state. While the state itself will help recruit, the ASD specifically will help charter schools find facilities in Tennessee. The current landscape of Tennessee’s charter schools was mapped out years ago in this Race to the Top application. The ASD has partnered with charter schools to help turnaround school districts and state and city leaders have gone out to recruit charter school leaders. We have seen both of those items happen right here in Nashville. If the Race to the Top application had nothing to do with charters, why was so much of the application about charter schools? The state, and their grant writers, knew what they wanted. They wanted more charter schools in the state of Tennessee. They got their wish. That’s the question at the heart of this analysis by Ezra Howard over at Bluff City Ed. Howard performs a longitudinal analysis of the performance of schools in the Achievement School District both before and after they were in the ASD to determine growth patterns. Turns out, ASD is not doing so well at improving growth (the stated goal of ASD). The entire piece is worth a read, but I’m going to hit some highlights here. When comparing two years of growth under each district, the gains made by the LEA are actually greater than the ASD by almost 2%, 7.75% compared to 5.84%. Chart 2 illustrates the rate of growth for these schools since 2010. In summary, achievement gains have not hastened under the ASD; indeed, they continue to follow a trend that was already established in the two years before the ASD took over. Once again, the LEA exceeded the ASD. Much discussion has been given to the regression of ELA scores in the first year of the ASD. But in examining the total growth of the same schools under the two different districts, it’s readily apparent that the LEA outperformed the ASD by over 4%, 4.64% total gains in P/A compared to 1.44%. Even the level of growth in the last year under the ASD, 3.40% in 2014, is less than that with the last year of the LEA before ASD takeover, 3.71% in 2012. Chart 2 exhibits the trend of growth for ELA, illustrating that the ASD failed to capitalize on the LEA’s momentum of increasing P/A rates in the same way that they were able to with math scores. First, can the ASD reach 55% P/A in order to be in the top quartile? Maybe. In order to reach that magic number of 55% P/A in all three of these subjects, the ASD would have to average 11.07% gains in Math and 12.67% gains in ELA over a 5 year period. However, in the last two years, the ASD has averaged 2.92% gains in Math and 0.72% gains in ELA. an exorbitant amount is spent on results that are, at best, no different than what the data suggests we could have expected had these schools not been taken over by the ASD. The ASD has already spent $18 million in Race to the Top funds in addition to other resources from the district and outside sources. But, according to Howard’s analysis, the gains are minimal at best and appear to be no better than what would have happened had the schools been left in the care of their district. Howard then raises the question of whether or not the ASD will end up being a long-term approach to school turnarounds based on its results. Again, all of what Howard writes is insightful and his approach to the data is solid. It is well worth a close read. The critic, Niccolo Machiavelli, taught us that assertions of virtue and integrity in politicians are often grinning masks of deception. So we are not surprised when politicians routinely over-promise and under-deliver. State leadership must coherently articulate K-12 Education Policy to citizens in a truthful manner. By state leaders continuing to ignore legitimate concerns, such as a vocal opposition to the Common Core State Standards and PARCC Assessments, policymakers and stakeholders across Tennessee have now been negatively impacted. This message has largely fallen on deaf ears at the highest level of state government, who continue to believe all is well. Members of the Tennessee General Assembly have listened and we are grateful to those legislators. Many citizens share the opinion that school teachers, principals, and superintendents are regarded by the administration as impediments to school improvement rather than partners. As an organization, Professional Educators of Tennessee have embraced higher standards, with the caveat that we should always seek higher standards and a commitment to student achievement. We were very enthusiastic when Governor Haslam pledged to make Tennessee the fastest growing state for teacher salaries in October 2013 and again in the State of the State in February 2014. We intend to help him keep his word. Governor Haslam has justly boasted “we are one of only six states in the country that has consistently increased state spending on K-12 education as a percentage of our total budget.” He has added that since 2011, “we’ve had the fourth largest increase in education spending compared to the rest of the country.” The questions we need to ask: How much of this has been Race to the Top Funds? Where were all those funds allocated? How much money was actually earmarked to the classroom? If policymakers boast that Tennessee is the fourth largest state for increase in education spending, then funds from RTTT need to factor into that calculation. Our estimation is that roughly $252 million of the RTTT grant was retained by the Tennessee Department of Education and never saw the inside of a school or classroom. These dollars went toward consultants’ contracts and partnerships. Our belief is that every dollar earmarked for education should be spent to benefit Tennessee school children. A teacher’s working conditions are our students’ learning conditions. If Tennessee had the most ‘growth’ of any state on the latest NAEP results led by our state teachers, why were their promised salaries a lower priority than unproven PARCC Testing or adding Media/Marketing and Event Coordinators at the Tennessee Department of Education? We support a delay and/or for the state to rescind the mandate for LEA’s to create a differentiated pay plan. Without the state’s increased financial contribution this creates an unfunded mandate on our local school systems. If the state mandates a requirement they should subsequently provide the necessary funding to facilitate that obligation at the local level. Unfunded mandates fly in the face of conservative orthodoxy and sound public policy. Teacher attrition is a serious issue. We must keep experienced educators in our classrooms. Tennessee colleges and universities are very adept at meeting the demand for producing quality educators in this state. Historically, approximately 50% of the teachers that graduate with a degree in education do not find a teaching job. 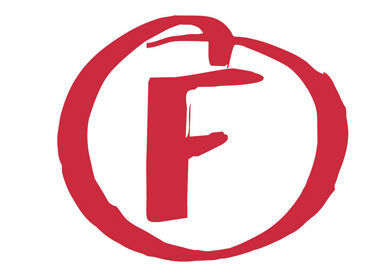 We would suggest a review and delay for all Teach for America (TFA) contracts. Researcher Elaine Weiss revealed that Tennessee spends more money per Teach for America recruit than any other state. Some reports state that total compensations ranging from $5,000 to $9,000, to as high as $15,000, have been paid to Teach for America for their recruits. If this is true, we should turn to our own graduates of traditional colleges of education looking for an opportunity to teach in their own state. Teaching is higher calling for professionals, not a pre-career placeholder. Therefore, it makes little sense to employ temporary teachers and spend scarce tax dollars and resources then watch a teacher leave after two years. Our goal should be hiring and retaining quality teachers that want to live, play, and worship in our communities long-term, instead of marking off days until a loan is forgiven and entrance to graduate school is accomplished. We do not seek to be unduly critical of Governor Haslam. We recognize that there are many competent people in the Department of Education and administration. However, the media may be the only hope to reach the Governor. We encourage the Governor to confront issues directly, answer emails timely and regularly meet face-to-face with education stakeholders on a consistent basis, not through intermediaries. Governor Haslam, you need our help and we want to extend our hand to offer the assistance you need. 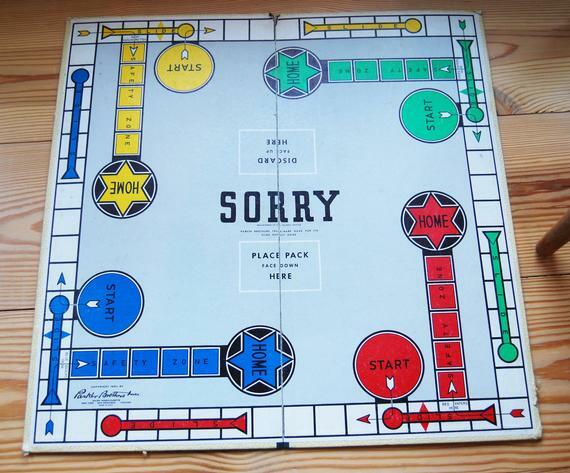 More on how Tennessee came to be short on revenue. As the Senate Education Committee conducts hearings today on the Common Core State Standards, Professional Educators of Tennessee has released a set of principles that they hope will guide policymakers on the Common Core implementation and on education reform in general. Keep Common Core State Standards in Language Arts and Math in place. Common Core is a starting point. The standards that are currently adopted are the minimal baseline and we must keep moving forward to increase these standards. Evaluate Tennessee’s role in PARCC. Delay using student test results for Teacher Evaluations, at least until 2016-2017 at the earliest. Make individual student data-mining in Tennessee illegal. Schools and schools systems need better policies in regard to school personnel having access to an educator’s personal summative and evaluation scores. Textbook selection and purchasing must be completely transparent. Conduct a public review of All Race to the Top Expenditures. Evaluate Tennessee’s No Child Left Behind waiver. Clarify the role of the State Board of Education. Keep all stakeholders at the table. Several points are worth noting. First, PET is made up of educators and is expressing support generally for the Common Core State Standards. That’s important for parents and policymakers to know – the standards are, as PET says, a starting point. They are an important starting point and a definite improvement over Tennessee’s previous standards. Next, PET is calling for a delay in the use of the PARCC tests for teacher evaluations. This makes some sense. Transitioning Tennessee’s value-added date from TCAP to PARCC make take some time and adjustment (it’s not entirely clear how TVAAS will handle the transition from all bubble-in tests to constructed response tests, for example). Delaying the use of this data in evaluations will give everyone time to see how the tests work and how to best fit them in to the TVAAS model. Meanwhile, the teacher evaluation system itself can be improved — it seems it has changed often in the early phases of implementation and an opportunity to reflect and improve seems warranted. Further, for those who insist that some student data be included on evaluations, there are certainly other data points which might be included in a teacher’s performance evaluation. I have been asked a lot about #7 — basically, what happened to all that Race to the Top money? How was it spent? Tennesseans deserve to know how the RTTT dollars were spent and what (if any) impact those dollars had on teachers and students. Finally, in light of a recent letter from Superintendents to Gov. Haslam, it seems #10 also deserves some attention. Intentionally including all stakeholders and ensuring their concerns are heard and questions are answered is a critical element in both Common Core implementation and in education reform in general. Stay tuned for updates from the hearings today and tomorrow.